Are We Expecting Too Much Out of iPad Apps? There is a certain amount of trust when you buy a iPad or iPhone app from the iTunes app store. Unlike desktop software, there are very few apps that allow any kind of demo version. Demos are generally ‘lite’, feature limited or you get a free app that you buy features via ‘in app purchases’. Most apps are very lightly supported by developer Web sites too. Only a couple screen shots if any and a few bullet points. With a few exceptions, the super low prices are what allows this type of software distribution work. The more expensive apps generally have a desktop app where it is assumed the iPad app will carry much of the similar features and level of professionalism. Much like FileMaker’s Bento and OmniGroup’s OmniGraffle. The quantity of iPad apps is still low enough that you can browse through a group you have narrowed with a search and come pretty close to what your lookng for within a few swipes. This will end soon enough as apps continue to be added daily and soon you will have endless options like on the iPhone. Not a bad thing! Just upping the amount of time to find what your looking for. Recently we were looking for a world clock. Digital numbers are fine but we were hoping for a face clock representation with hands. These are generally easier to glance at out of the corner of your eye and quickly know the time. For our needs; Portland Oregon, San Francisco California, Dallas Texas, New York NY, London UK, Hanover Germany and Hyderabad India. If we had to we could narrow to three or four. 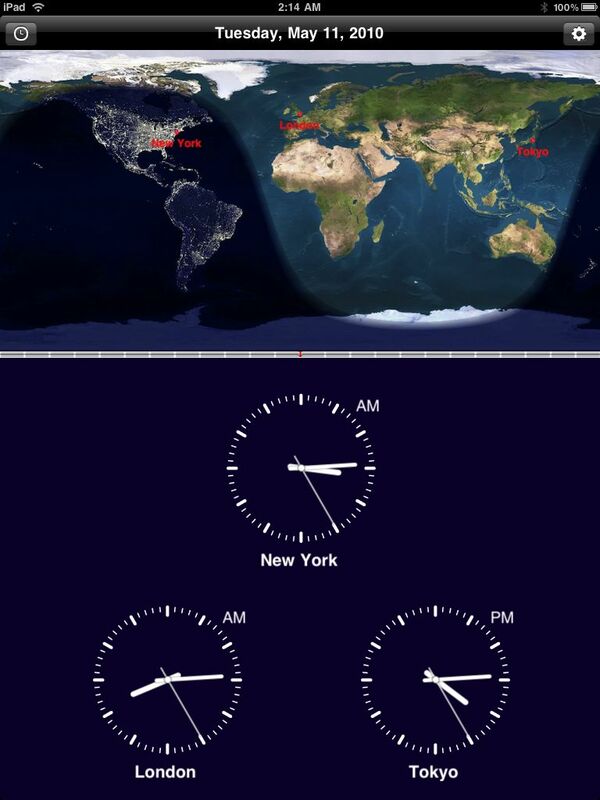 Right off, the screen shots for The World Clock seemed to hit what we needed. It even carries the added feature of a globe so we know if we are looking at night or day before we call. It has a nice added bonus of being able to touch a place and move your finger to another place to show the difference in times between the two. The app allows for portrait or landscape views which makes it handy to jump to no matter what your doing on your iPad for a quick reference. 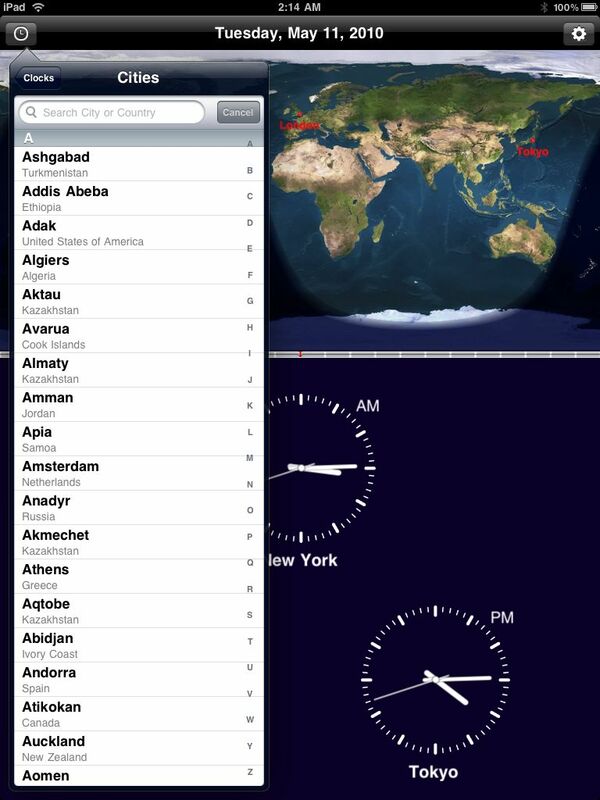 There are pull downs to set which cities are shown, to allow the clocks to be heard ticking and if you wish to show sunrise/sunset next to each city/clock. You may be wondering why we are not showing the seven city clocks we were interested in. Well, because only New York and London are available in their list. Hyderabad, sixth largest city in India, Portland Oregon… don’t get us started… they seem like major cities but aren’t available. We are very hopeful the developer will add our cities so the app becomes usable for us. Till then, we will get out our world map of cities and look for cities next to the big ones we are interested in and use those.